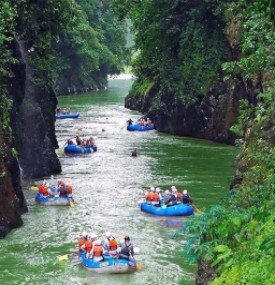 Western’s nine-day/eight-night Costa Rica Vacation Package includes conquering the rapids of the legendary Pacuare River, rated one of the most beautiful in the world. SALT LAKE CITY – Veteran outfitter Western River Expeditions is inviting travelers to tweak the company’s recently launched 9-day multi-sport Costa Rica adventure to create their own personalized experience. This trip is offered year-round with ultimate flexibility in scheduling for a minimum of two participants who choose their own date of trip departure based on availability. The per person (double) rate is from $3,295 (minimum age 12). See: www.westernriver.com/costa-rica-vacation-package. For starters, guests may choose to shorten or lengthen their core trip with final price adjusted accordingly. They can add activities and regions of specific interest to them or skip some parts of the suggested itinerary. For example, if they’re escaping a stateside winter, they may want to add beach time or sport fishing and surf lessons while on the Pacific Coast in Manuel Antonio National Park that like most of Costa Rica enjoys a warm and dry climate in the winter months. Or while rafting the Pacuare River they may want to visit to the Cabecar Indian village enroute for an immersion into native culture. Other add-on options might include biking and hiking around Arenal Volcano or a trip to Tortuguero National Park on the Caribbean coast to get up close and personal with Green, leatherback, and Hawksbill sea turtles that nest on the beaches here. Western River Expeditions (http://www.westernriver.com/) for over 50 years has helped people overcome fears when it comes to rafting on rivers. It introduced its Costa Rica program earlier in 2016 to deliver the most highly curated experience possible and at the same time to help alleviate the stress and anxiety of planning foreign travel. Western’s nine-day/eight-night Costa Rica Vacation Package includes conquering the rapids of the legendary Pacuare River, rated one of the most beautiful in the world. This river slices from Costa Rica’s interior to the Caribbean, enroute creating some of Costa Rica’s most exciting rapids flanked by pristine rainforest. Guests stay for two nights at Pacuare Lodge, rated one of the top jungle eco lodges anywhere. An off-river day explores waterfalls and a zip line adventure above a tropical rainforest canopy. The rafting continues downriver to the takeout where a minibus awaits for the trip to Arenal Volcano and a buffet dinner on the open air terrace at Tabacón Grand Spa Thermal Resort. Between time spent splashing in thermally heated pools at the base of the towering volcano, Arenal participants enjoy a rainforest adventure focused on monkeys, iguanas, sloths and birds from the perspective of 15 hanging suspension bridges over which guests experience the forest from the ground (like a Jaguar), from the middle (like a Monkey) and from the treetops (like an Eagle). Later comes a scenic drive that ends at Manuel Antonio, a village on the Pacific Ocean. Spread over a forested ridge overlooking the Pacific with unforgettable coastal views, the area’s postcard-perfect beaches include Playa Manuel Antonio, a crescent of ivory sand between the rainforest and calm waters, perfect for swimming and snorkeling. Nearby Playa Espadilla is a long beach lined with coconut palms and Indian almond trees. While here guests enjoy a 2.5-hour nature walk and sunning on the beach in Manuel Antonio National Park, named one of the world’s most beautiful national parks by Forbes. The rate includes eight nights and breakfasts at four stellar properties; three lunches and three dinners; transfers to and from San Jose airport, hotels and activity sites; rafting; zip lining; soaking in the thermal waterfalls and pools of T Tabacón; guided walks and a tour of Manuel Antonio National Park to see sloths and numerous species of monkeys. For a copy of Western River Expeditions’ 2017 catalog, questions, availability and reservations call toll-free: 866.904.1160 (Local: 801.942.6669), or visit the newly enhanced website at www.westernriver.com.